“Half the town is collecting morels from last year’s burned area up at Beehive…what a spectacle! Get your camera and head up for some real “wilderness” watching and off-beat interviews. I was hunting for sub-alpine waxy caps and snowbank morels 3 weeks ago up on Roaring Ridge above Ardenvoir, between Mosquito Ridge and Moe Ridge, and got caught with my sister in that horrific hail and snowstorm at about 4,500 feet…had to spend the night up there as we got mired in hail-slickened mud/snow. Norbie (husband) borrowed the neighbor’s big 4×4 truck and found us at about 4a.m., after the sheriff’s department had failed miserably and given up. What a tale! Now was the time to gamble. Maybe we could sweet talk Sherri into sharing some of her classified shrooming secrets. When should one look for what? Generally speaking, what likes to grow where and why? More specifically, where and when did she go looking for what? Ahhh, but Sherri is cagey, crafty, and maybe even a wee bit crazy about protecting her coveted caches. Like a fisherman who will only relinquish the location of a prized hole if you kidnap his first born and demand such knowledge as ransom, Sherri wasn’t about to reveal specifics. She did, however, send us some pictures as bait – or inspiration – to get out there on your own and join the hunt. Sherri is of the school that the adventure of the hunt is not as much fun if you’re shown on a map that X marks the spot. 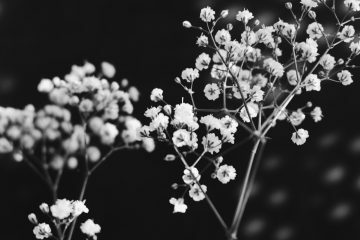 The fun and the learning from the hunt is to sleuth out general clues about particular shrooms – where and why they prefer particular sites and when they rear their heads. Then comes the fun of wandering the hills on your own to unearth secret stashes of edible gold. 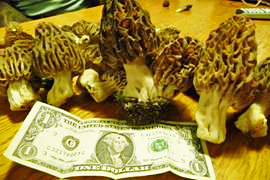 Interestingly, as we were writing about Sherri, Rick Steigmeyer with the Wenatchee World wrote this story about finding morels near the Beehive Reservoir. 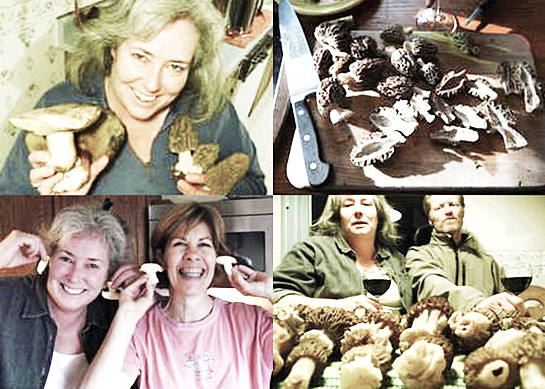 Go out with and learn from a mushroom expert. Don’t rely on a book for mushroom identification. Stick to a few species you know. Bag known varieties separately from unknown varieties that might be poisonous. Eat a small amount of a mushroom considered “edible” to make sure it is before eating more. Save part of the mushroom to identify if you do get sick. This article was originally published on 6/25/10.